Who says a trip with your sisters or best friends has to center exclusively around spas and shopping? Schedule some true bonding time with a girlfriend getaway that also packs in some serious adventure. You’ve been planning a vacation with your closest friends for ages—and finally managed to lock down a week where everyone can get away. Now comes the fun part: choosing where and how you’ll spend your long-awaited getaway. While plenty of packaged trips revolve around shopping, spa time, and specialty cocktails, you don’t have to stick with tradition in order to have the ultimate girlfriend getaway. In fact, you may find that indulging your collective penchant for adventure will make for a far more memorable experience—and leave with your crew with photos and memories that are far more satisfying (and longer lasting!) than any specialty martini or mani/pedi. Before you book your next girls-only getaway, check out our top picks for beach adventure that blend luxury with some action-packed fun. 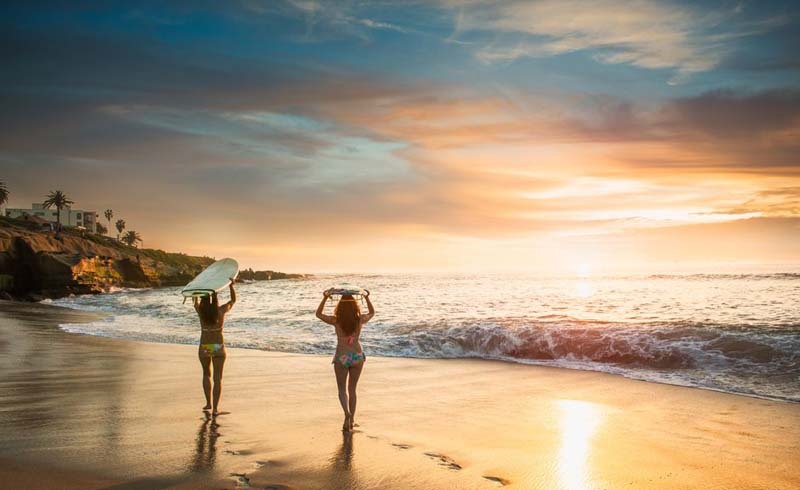 All-girl surf camps are popular among women looking to rejuvenate and challenge themselves (the temperate waters and crystalline beaches don’t hurt either). Costa Rica’s village of Malpais and Playa Carmen breathe life into the local phrase ”pura vida,” or pure life, with its hidden surf spots and warm water pools canopied by jungle foliage. The seven-day, six-night adventure includes daily surf instructions and sunset sessions with high performance boards and apparel. Glide over Costa Rica’s Pacific coastline and view sea life in the depths below before retreating to the luxury resort for a dip in the pool or a therapeutic massage at the beachfront spa. Inquire about the fishing tour where you can explore Cabo Blanco National Park and an underwater volcano before reeling in tuna and Mahi Mahi. Best time to visit: November to May during Costa Rica’s dry season––this is also when tourism is at full tilt, so book in advance. If you’re a nature buff looking to up the ante on your next trip, then heli-hiking is your sport. Santa Catalina, a 22-mile long island off the coast of California, is known for the schools of bright orange Garibaldi and flying fish teeming in its local waters, but the rugged terrain offers more for a group of adventurous women. Score a helicopter ride and drop off at the Two Harbors Heliport or the Empire Landing if you choose to stay in the island’s Pavilion Hotel. If you choose Two Harbors landing, you can trek around the West End village, down to the coast, or up to Ballast Point where you’ll be rewarded with sweeping oceanic views (and killer calves); the latter route involves a guided 5 mile (8 km) intermediate hike to Isthmus (Two Harbors), which you can also bike. The average tour lasts about five hours, but make sure to book 72-hours in advance. Best time to visit: December to March is the rainy season; go April through November for afternoon temperatures averaging 75 degrees F.
Usually vacations are all about immersing yourself in pure indulgence, but this voyage through Maldives offers an incredible opportunity to give back—on the trip of a lifetime. You’ll strike the perfect balance of adventure and detoxification as you sail the Indian Ocean aboard the Ocean Dancer, a 110-foot long surf and dive live-aboard. Spend seven days attending daily yoga workshops, learning relaxation and breath work techniques you can use immediately after your trip, and surfing and scuba diving around the Maldivian atolls (ancient islands). The last three days are spent at the Soneva luxury eco resort where you’ll bring rain water-harvesting equipment inland. This gear will help collect clean drinking water for locals, diminishing the need for plastic bottles—and will help minimize your carbon footprint. Best time to visit: Dive season is November to April (dry season) and surf season is best from May to October (monsoon season). Temperature is moderate all year round. If you’ve ever wished you had your own private retreat far from the stresses of daily life, then cast away to Zaton Bay Beach, one of Croatia’s many inlet beaches dotting the northernmost part of Dubrovnik (a city along the Adriatic Sea). Mountain ridges shield the deep water from Dalmatia’s coastal winds and motorboat congestion, so you can paddle around Renaissance stone villas, soaring cliffs and the nearby Elafiti Islands in relative seclusion. Coastal coves camouflage private pools and underground springs, great for snorkeling, cliff jumping, or sunbathing. Enjoy a low-key outdoor adventure before turning back to one of the villages for a bite to eat. Morning tours of the area run from 9 am to 1 pm and afternoon tours from 3 pm to 7 pm, departing from Hilton Garage. Best time to visit: July to August when the water is warmest. There are plenty of reasons to plan a big adventure down under with your closest friends, but it seems Australia has added one more: Sand tobogganing. Think sledding—only on a sand dune with a waxed board—and you’ve got this new Aussie pastime down pat. Dare your girls to go headfirst, forwards or backwards down Moreton Island’s 900-foot tall (280 m) Mount Tempest––the tallest sand hill in the world­­––for an unparalleled rush. Then move on to Cape Moreton Lighthouse to spot whales, turtles and dolphins, which you’ll hand-feed later in the night at the resort. Spend the remainder of your time snorkeling around the famed Tangalooma Shipwrecks­­ cruising on the Marine Wildlife Boat Spotting Tour or indulging in a Brisbane River Cruise to cap off the trip. Best time to visit: September to May, because June to August are winter months.